Garver has kicked off a project to reconstruct a portion of Runway 13/31's parallel taxiway at Nashville International Airport. The majority of Taxiway Kilo's asphalt pavement has dropped below the minimum service level, and more than 432,000 square feet of pavement will be reconstructed. Design aspects also include correcting non-compliant longitudinal gradients as well as runway and taxiway safety areas. 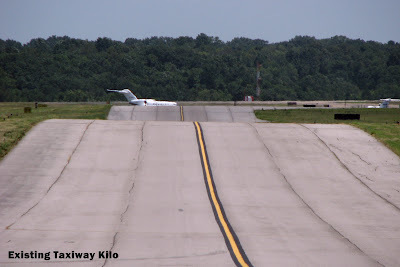 Taxiway Kilo is one of the most heavily used taxiways at the airport. To keep from impacting airport operations, Garver and its subconsultants recently performed the topographical survey and geotechnical investigations over a three-night period from 10pm to 6am. Garver is also providing construction phasing, pavement design (which includes a life-cycle cost analysis between asphalt and concrete pavement sections), all geometric design, drainage improvements, electrical and NAVAID design, bidding, and construction support services. Garver's previous projects at Nashville International Airport include reconstructing Runway 2L/20R (which featured a unique pavement recycling process) and reconstructing and rehabilitating numerous taxiways throughout the airfield.